An interactive exhibit that reveals nature as a master engineer through the creation of larger than life robotic animals. The Robot Zoo exhibit provides hands-on learning opportunities to discover how animals work, and how to engineer and animate robots. Opening event January 19, 2019. The Event will include a speaker from the Smithsonian's National Air and Jedi lightsaber training classes presented by Husker Saber Academy. 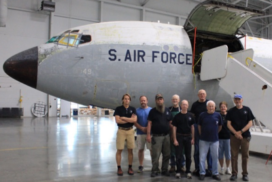 Stay up-to-date with the ongoing restoration of the EC-135 "Looking Glass!" This integral component of the United States strategic deterrence in the Cold War is being brought back to its former glory in the Durham Restoration Hangar. The Museum did not experience any flooding as we are located on exit 426, just off interstate I-80. We are open 9 a.m. - 5 p.m. daily. Our heart goes out to our Ashland neighbors and all those affected by flooding. Open Christmas Eve and New Years' Eve 9 a.m. - 2 p.m. The SAC Aerospace Museum is a registered 501(c)(3) non-profit organization. The Museum does not receive government funding and relies on the generosity of civic minded individuals and corporations to support its programs. Parking is free for our guests. If you are taking public transportation to the Museum, please make sure you secure a ride back to your destination prior to being dropped off. Commercial photography is prohibited. You may take pictures for personal use but not for resale or for a profit. Electric scooter is available for rent for $5. Push wheelchairs are available for free. The SAC Lunch Café is now open daily 10:30 a.m. – 2 p.m. The Strategic Air Command & Aerospace Museum is a Smithsonian Affiliate.